A cutting board and kitchen knife designed for use by individuals with upper extremity, fine motor or grasping disabilities or tremors. 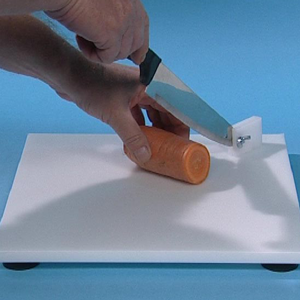 This cutting board and knife combo features 4 suction cups at the bottom to secure the board to the counter, and the chef knife attaches to the cutting board on a pivot to control the chopping motion. The chef knife has an ergonomically shaped handle for easier grasping and a stainless steel blade.